Saturn's ice-covered, ocean-harboring moon Enceladus, seen by NASA's Cassini spacecraft. 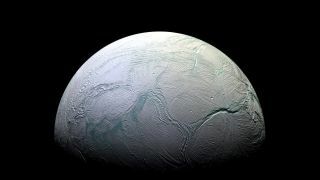 SEATTLE — A privately funded team may beat NASA to the punch when it comes to looking for life on the Saturn moon Enceladus. Breakthrough Initiatives — a program founded by billionaire tech investor Yuri Milner to hunt for alien life and help explore the cosmos — is considering launching a mission that would fly through the plume of water vapor and other material emanating from Enceladus' south polar region, Milner said here yesterday (Nov. 9) at The Economist magazine's inaugural global space summit, called "A New Space Age." The plume provides a way to sample this ocean without even touching down on Enceladus. Cassini flew through the plume repeatedly during its epic Saturn mission, which ended with a fiery plunge in September, but the probe was not outfitted with life-detection gear. So astrobiologists have been clamoring to go back. Milner — who already funds the $100 million intelligent-alien hunt Breakthrough Listen as well as Breakthrough Starshot, a $100 million interstellar-flight project — shares their enthusiasm. "We formed a sort of little workshop around this idea: Can we design a low-cost, privately funded mission to Enceladus which can be launched relatively soon and that can look more thoroughly at those plumes and try to see what's going there ahead of a more expensive mission that NASA is considering right now, which might take maybe 10 years to launch?" Milner said. That possible NASA mission would be an effort under the agency's New Frontiers program with a cost cap of approximately $1 billion. Two of the 12 candidates the space agency is mulling for the next New Frontiers project, which will launch in the mid-2020s, are Enceladus-focused. NASA is expected to pare this list down to a few finalists by the end of the year and announce the selected mission in 2019. Milner didn't provide further details about the possible Breakthrough Initiatives Enceladus mission, such as its projected cost or timeline. He said the organization is taking a broad look to assess the various options. "How can we, for the first time ever, design and send — launch, actually — a privately funded interplanetary science mission?" Milner said. "That's what we're thinking about."